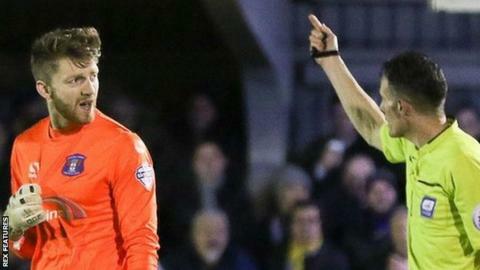 Carlisle United boss Keith Curle has criticised the match officials after Tuesday's defeat by AFC Wimbledon. Curle's side played most of the second half of the 1-0 loss without goalkeeper Mark Gillespie who was sent off for a professional foul on Tom Elliott. "What gets managers frustrated is when there's an incident and you ask the linesman what he saw," Curle said. "The stock answer is 'I didn't see it'. You're thinking if you didn't see it, it means you're not paying attention." It is the second time in a week that Curle has been critical of a refereeing decision after Jabo Ibehre was sent off after 34 seconds by Jeremy Simpson against Accrington, a decision that was ultimately overturned. Following that match, Simpson took charge of Bolton's 1-1 draw with QPR in the Championship. "As a reward, the referee [Darren Deadman] will be refereeing in the Championship next week as we had last week when, in my professional management opinion, that referee [Simpson] had a disappointing display and he was rewarded with a Championship fixture," Curle told BBC Radio Cumbria. "If we think it is a genuine sending off then we will say the referee is right and we hope he enjoys his fixture in the Championship." Curle admitted he could be in trouble for voicing his complaints about Deadman, but said it would be a waste of time time discuss his issues with him. "I've been told by the referee that he's going to report me because he asked me to go into his office to talk," Curle added. "I said we've got a six-hour coach journey and I don't want to waste the amount of time that it would take to discuss that amount of mistakes. I don't want a six-hour journey to turn into an eight-hour journey."